Definition at line 1713 of file lscript_tree.h. Definition at line 1716 of file lscript_tree.h. Definition at line 1721 of file lscript_tree.h. 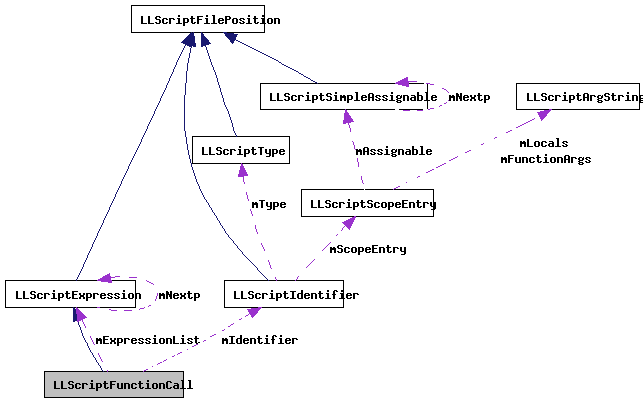 Definition at line 7258 of file lscript_tree.cpp. Definition at line 7074 of file lscript_tree.cpp. References LLScriptByteCodeChunk::addByte(), LLScriptByteCodeChunk::addInteger(), LLScriptByteCodeChunk::addU16(), LLScriptScope::findEntryTyped(), gErrorToText, LLScriptGenerateErrorText::getErrors(), LLScriptExpression::gonext(), LIT_FUNCTION, LIT_LIBRARY_FUNCTION, LOPC_ADD, LOPC_CALL, LOPC_CALLLIB_TWO_BYTE, LOPC_POPBP, LOPC_PUSHARGE, LOPC_PUSHARGI, LOPC_PUSHBP, LOPC_PUSHE, LOPC_PUSHEQ, LOPC_PUSHEV, LOPC_PUSHSP, LSCP_EMIT_ASSEMBLY, LSCP_EMIT_CIL_ASSEMBLY, LSCP_PRETTY_PRINT, LSCP_SCOPE_PASS1, LSCP_SCOPE_PASS2, LSCP_TO_STACK, LSCP_TYPE, LSCRIPTOpCodes, LSCRIPTTypeByte, LSCRIPTTypeHi4Bits, LSCRIPTTypePush, LSERROR_FUNCTION_TYPE_ERROR, LSERROR_UNDEFINED_NAME, LST_FLOATINGPOINT, LST_INTEGER, LST_KEY, LST_LIST, LST_NULL, LST_QUATERNION, LST_STRING, LST_VECTOR, LLScriptScopeEntry::mCount, mExpressionList, LLScriptScopeEntry::mFunctionArgs, mIdentifier, LLScriptScopeEntry::mIDType, LLScriptScopeEntry::mLibraryNumber, LLScriptIdentifier::mName, LLScriptScopeEntry::mOffset, LLScriptExpression::mReturnType, LLScriptIdentifier::mScopeEntry, LLScriptScopeEntry::mSize, LLScriptArgString::mString, LLScriptScopeEntry::mType, NULL, print_cil_arg_list(), print_cil_type(), LLScriptExpression::recurse(), LLScriptIdentifier::recurse(), and LLScriptGenerateErrorText::writeError(). Definition at line 1729 of file lscript_tree.h. Definition at line 1728 of file lscript_tree.h.